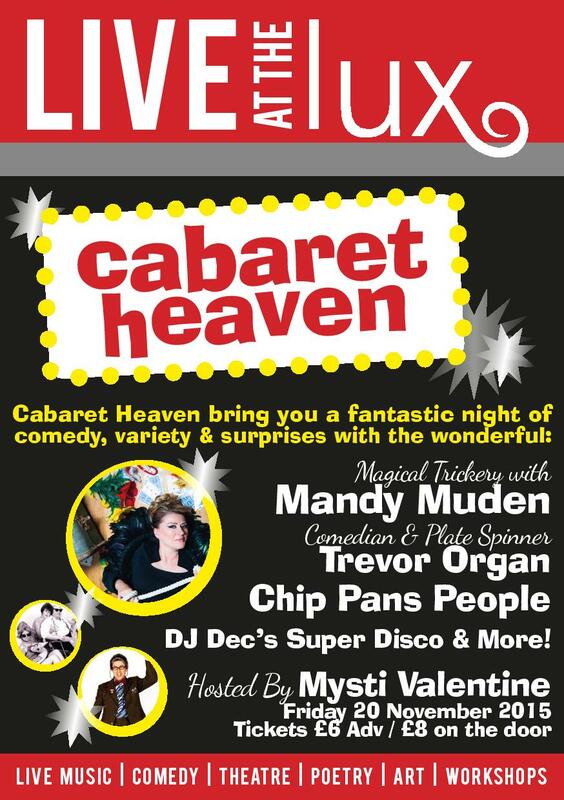 Cabaret Heaven returns with a winter spectacular : two headline comedy acts from London and a brilliant swing time dance band. Sid Bowfin is a world class violinist and fool who’s taken his show around the world-including wowing the Arts Festival in the square a couple of years ago. 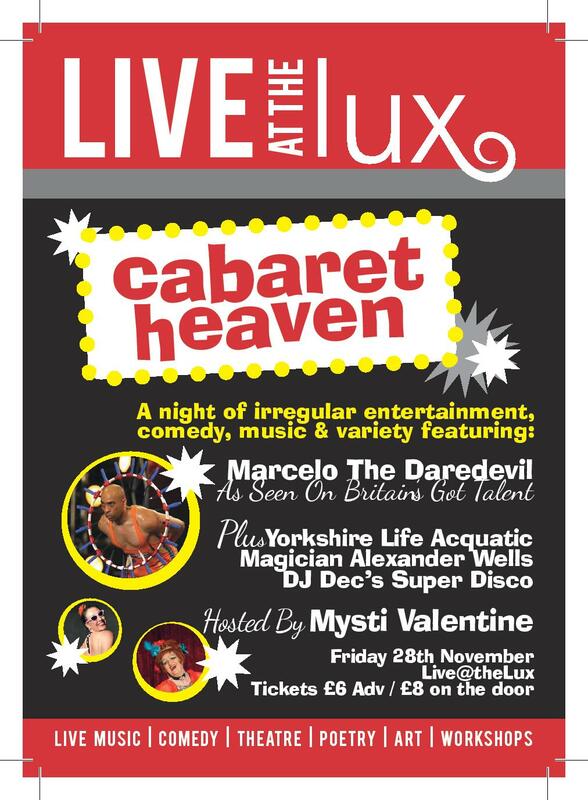 We wanted him back with his critically acclaimed cabaret show. Mandy Muden is the winner of the Carlton Magic Circle Award for Comedy in Magic. She’s a brilliant magician, hilarious and takes no prisoners. Mandy has numerous TV credits and her tour includes the Magic Castle, Las Vegas, the Ritz and ….the Trades Club. And dance band vintage reprobates and genre alchemists, the Black Sheikhs fire heady concoctions of Punk, Pop, Rock and Swing, steaming into the 21st century. Lord Acton and his band of virtuosos take the popular songs of today, and dress them up in the snazzy rags of the swing era. 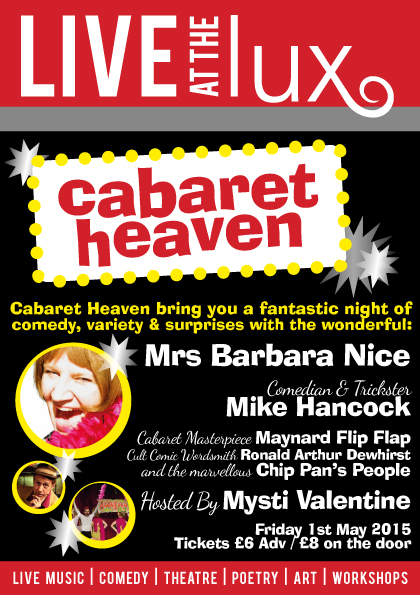 Plus MC Bernard Otter, hostess Peggy Lee and gender illusionist Mysti Valentine. Please dress up to get down. 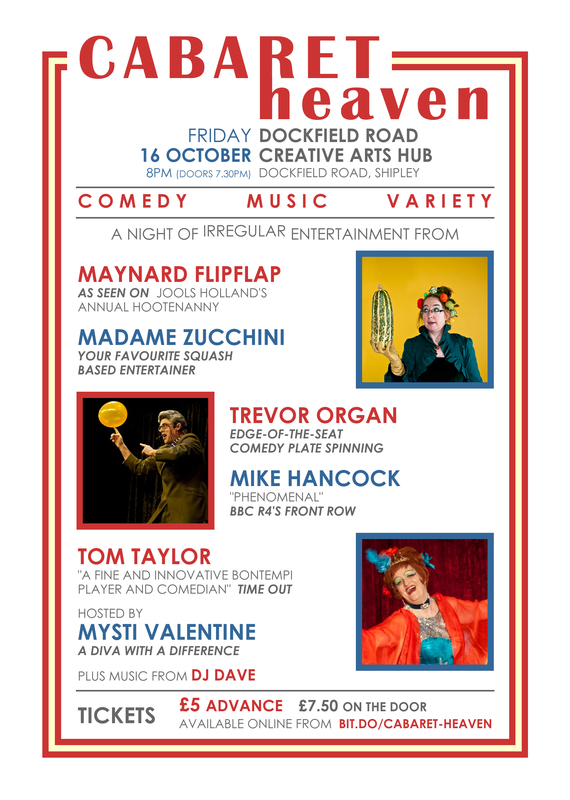 All your Cabaret Heaven favourites are appearing in this all-star line up in the beautiful setting of the Spiegeltent. 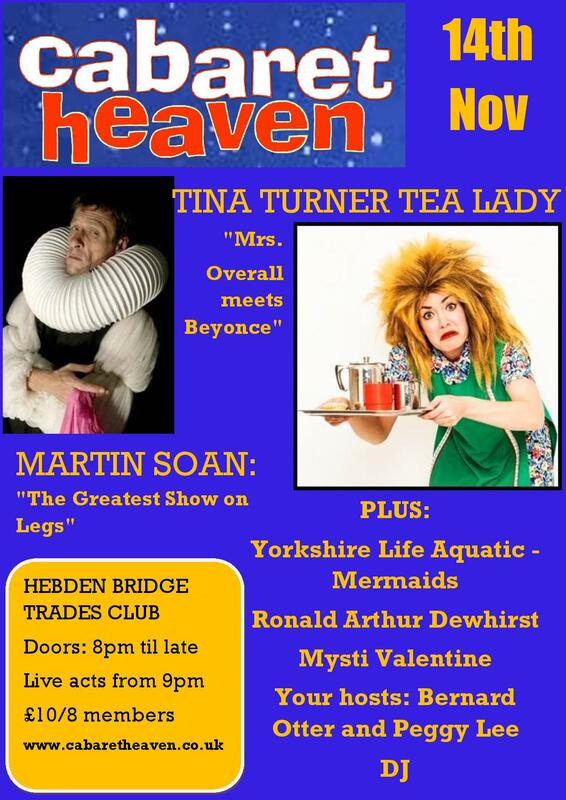 Book now to avoid disappointment! 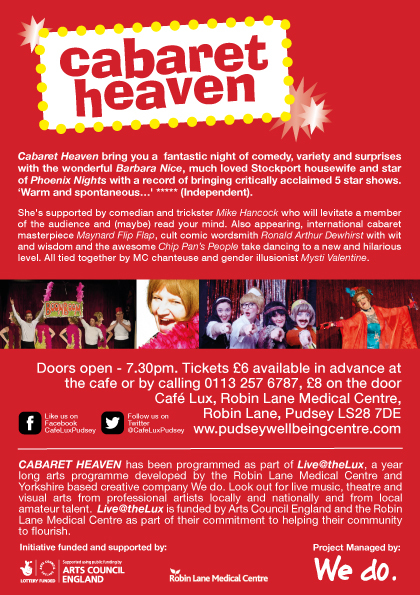 A perfect Xmas night out in the 1920s splendour of the Speigeltent at the refurbished Halifax Piece Hall with the very best in contemporary cabaret and comedy from legendary producers Cabaret Heaven. 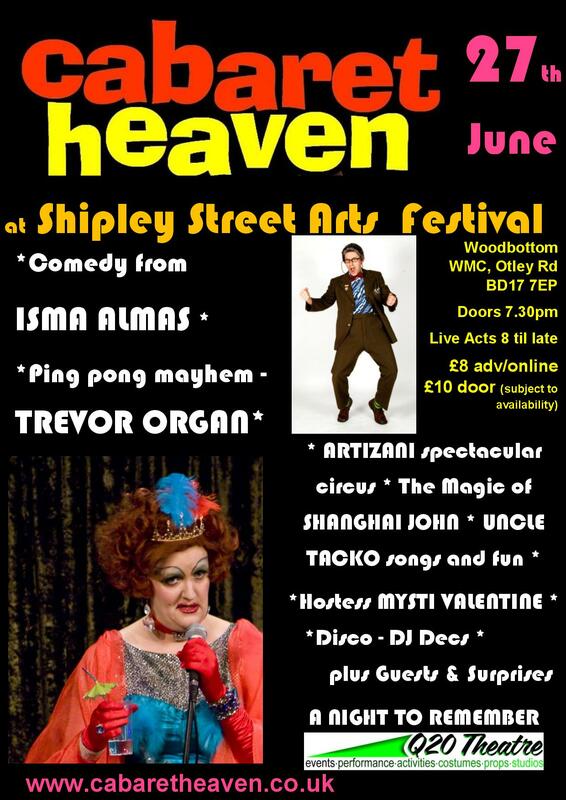 Described on the BBCs Front Row as “a phenomenal night” with ladder walker and unicyclist Zoot, international mind reader Harrison Richards, gender illusionist and chanteuse Mysti Valentine, levitation from Mike Hancock, juggler Pete White, award-winning fool Maynard Flip flap and hostess Peggy Lee. 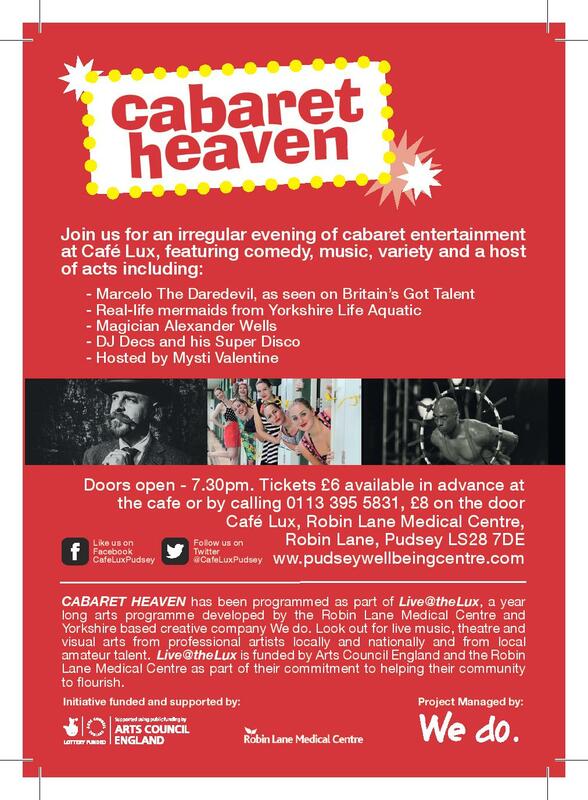 We’re really proud of the 10 years Cabaret Heaven was a regular feature at the Brudenell Social Club in Leeds. The venue has changed a lot since we first went there. Here’s a bit of history from club members and regulars there…. 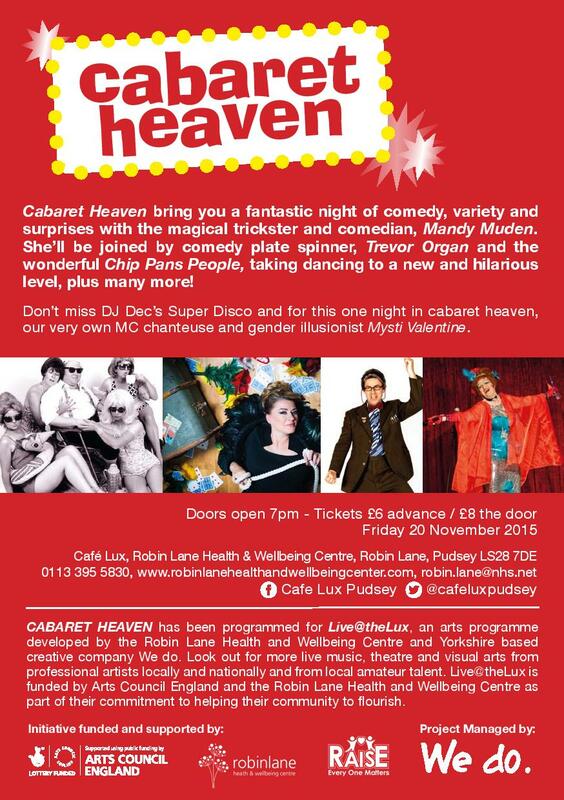 Cabaret Heaven Winter Global Warmer with 10 top acts and Lula & the BeBops in aid of Greenpeace. 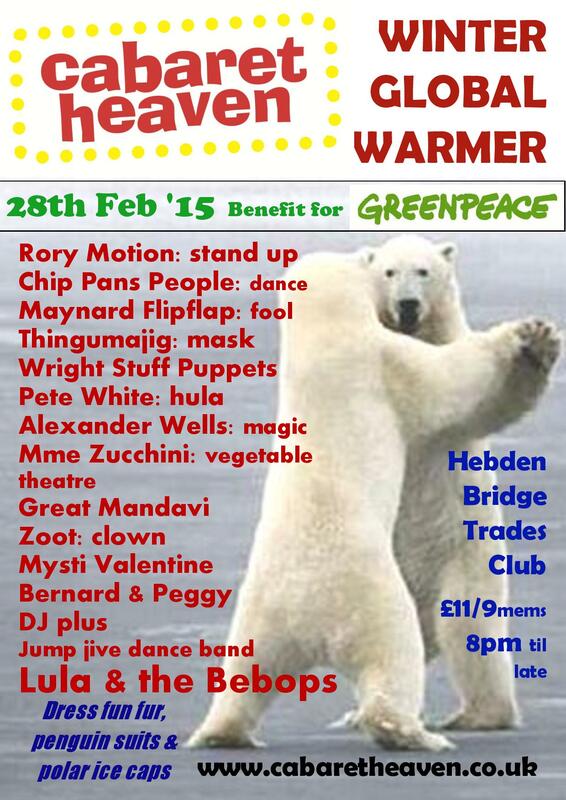 On Sat 28th Feb at Hebden Bridge Trades Club 10 of the top comedy and variety acts around present short brilliant spots and jump jive band Lula & the BeBops melt your frozen dancing feet. It’s how cabaret ought to be and the list is awesome: stand up Rory Motion, mask and music from handmade parade heroes Thingumajig, top clown Maynard Flipflap, hilarious puppetry from the Wright Stuff- makers of Ruff Daddy, Madame Zuccini’s fantastic vegetable theatre, wildly funny dance troupe Chip Pan’s People, hula hoop hysterics with Trevor Organ, the gorgeously foolish Zoot, the great Great Mandavi, marvellous Mysti Valentine and hosts Peggy and Bernard and DJ. All topped off by the fabulously danceable Lula and the BeBops. Plus arctic landscapes from Steve Morgan. Dress: fake fur, penguin suits and polar ice caps.